In the Horror genre, there has been an age old curiosity of how the meeting of beloved monsters would play out on the big screen. Turning back the clock a few decades, this legacy of storytelling was previously taken on with films such as Frankenstein Meets The Wolf Man (1943), Dracula vs. Frankenstein (1971), and, as late as 2003, there was Freddy vs. Jason, followed by 2004’s Alien vs. Predator. Now in 2015, writer/director Damien Leone (All Hallow’s Eve 2013) combines some unruly forces with his dramatic tale, titled Frankenstein vs. The Mummy. Released on DVD via Ruthless Pictures on February 10, 2015, the film’s cast includes Max Rhyser (Homeland 2008, Chaser 2013), Ashton Leigh (Where Strippers Go to Die 2010, The Woodshed 2012), Boomer Tibbs (Working Girls 1986, Rice Pudding Please 2012), and Constantin Tripes (Partisan 2013). With a title that immediately grabs any Horror lover’s attention and extremely modern cover art announcing, “The epic battle has begun,” one might think Frankenstein vs. The Mummy would mirror films like Underworld (2003) or Van Helsing (2004). Proving the old adage to never judge a book by its cover, this film will surprise many viewers. Taking place within a medical university, the audience is introduced to the modern day Dr. Victor Frankenstein (Rhyser) and Egyptologist Naihla Khalil (Leigh), both young, intelligent professors at the school. It immediately becomes evident that they are passionate about their work: Victor is in a search of immortality and Naihla is allured by existence of the human soul. When the two cross paths, despite their oppositmg philosophies, there is a chemistry that connects them much deeper than merely lust. Behind closed doors, Victor works within the bowels of an abandoned hospital, paying a homeless man (Martin Pfefferkorn: World Trade Center 2006, I Sell the Dead 2008) to collect human remains so that he can build a man and inevitably re-animate him. Meanwhile, Naihla, along with colleague Professors Walton (Tibbs), and Isaac (Robert MacNaughton: E.T. the Extra-Terrestrial 1982, I Am the Cheese 1983), look to study a mummy (Brandon DeSpain: All Hallows Eve 2013) found during an expedition. Professor Walton tinkers with the cursed pharaoh and accidentally unlocks a ravenous evil that possesses him. Unaware that the Professor has been made spellbound by the mummy, the Egyptologists suddenly notice people disappearing one by one. While the mummy is building strength, seeking revenge, and looking to free his cursed soul, Victor is one step away from a major breakthrough that will defy all laws of nature. Meeting for what was supposed to be their final exchange, matters get ugly as the homeless man demands a massive ransom for the brain, the most important body part of all. Unwilling to allow his vision to unravel, Victor stops at nothing to close the deal and obtain the last piece to his puzzle. Successfully bringing the corpse to life, the monster is born. Is he a gentle giant or a murderous villain? When Naihla discovers Victor’s secret experiment, she is mortified by what he has done. 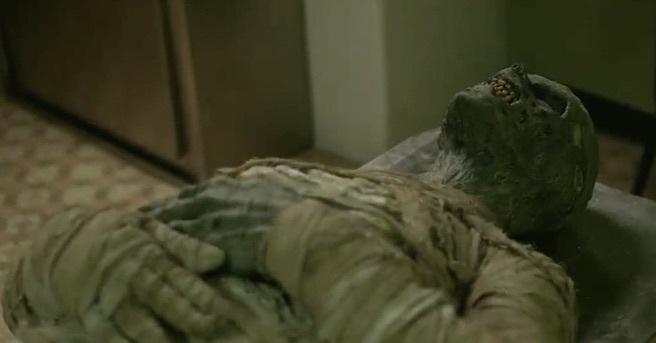 She also begins suspecting Professor Walton’s behavior and likens it to the mummy. Having no where to turn, Naihla finds herself caught between the desire of the two monsters, both of whom will stop at nothing to get what they want. As all hell breaks loose, Victor realizes the error of his ways and devotes himself to protecting Naihla at any costs. Amidst the chaos, the undead villains meet for a gruesome battle for the ages. Relying heavily on a strong story combined with nonstop action, Frankenstein vs. 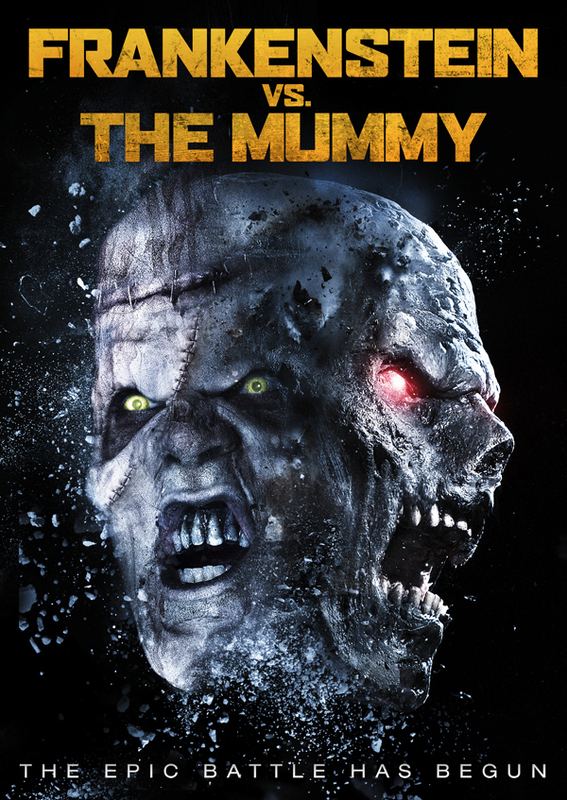 The Mummy is a pleasant surprise for those looking for something more than a CGI video game-like monster faceoff. Leone does a fine job of crafting the characters and creating a bond between Victor and Naihla. Equally, Rhyser and Leigh are highly impressive in their performances. On the other end, those looking for some blood and gore will not be disappointed with Frankenstein vs. The Mummy, as Leone and his team do a fantastic job with the practical makeup effects. Overall, Frankenstein vs. The Mummy is an unexpected film with a cleverly thought out storyline, a slower pace, and strong cast of actors. Give this one a shot for a compelling film from start to finish. CrypticRock gives Frankenstein vs. The Mummy 4 out of 5 stars.